If you wish to call the Employee API from server side C# code (say an MVC controller) or a desktop application, you will typically use HttpClient component. The overall process of JWT authentication with HttpClient remains the same. You first grab a JWT token by calling the Security API and then include this token in the authorization header while calling the Employee API. The above page looks quite similar to the jQuery example we developed earlier. However, the big difference is that the three buttons Sign IN, Sign Out, and Show Data cause form submission. 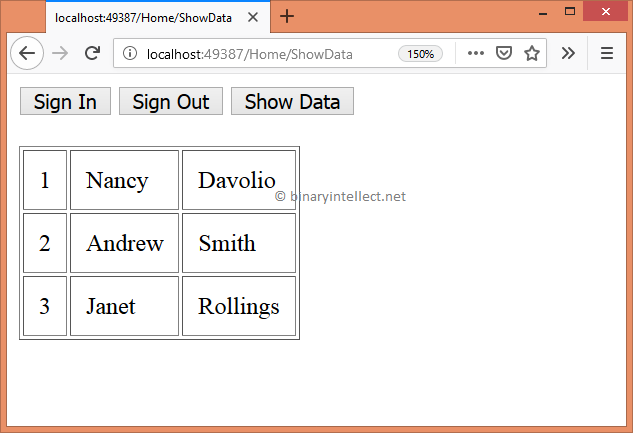 The HomeController handles these form submissions through three actions namely Login(), Logout(), and ShowData(). These actions use HttpClient component to call the Security API and the Employee API. Let's see these three actions one-by-one. Once Session state is made available to your application, you can store and retrieve the JWT token in it. Notice that the form tag helper doesn't specify the controller and action name. That's because each of the buttons is submitting to a different action. Therefore, the button tag helper specifies the asp-action for each button. The Sign In button submits to the Login() action, the Sign Out button submits to the Logout() action, and the Show Data button submits to ShowData() action. The response from these actions is displayed on the page using Message ViewBag property. The Login() action invokes the Security API's Login() action in an attempt to retrieve a JWT token. The token is then stored in the Session. The following code shows how this is done. The above code creates an instance of HttpClient component and sets its BaseAddress and content type header. Make sure to change the base address as per your environment. The code then creates a User object and stores UserName and Password in it. This User object needs to be sent to the Security API for authentication purpose. In order to send User object to the Security API we convert it into StringContent object and then invoke PostAsync() method. The PostAsync() method of HttpClient makes a POST request to the Security API and carries User credentials along with it. Then the code stores the JWT token into Session using SetString() method. A success message is returned to the client. The Logout() action simply removes the JWT token stored in the Session. A message is displayed to indicate successful logging out operation. The ShowData() action is where we call the Employee API. While calling the Employee API we need to send the JWT token received earlier in the Authorization header. The following code shows how it is done. The above code creates HttpClient object as before. It then adds the Authorization header using DefaultRequestHeaders.Authorization property. The scheme parameter of AuthorizationHeaderValue is set to Bearer and the JWT token stored in the Session is passed as its second parameter. Then we call GetAsync() in an attempt to receive the employee data. If HttpResponseMessage returns a StatusCode of 401 (as indicated by HttpStatusCode.Unauthorized enum value) it indicates that the authentication has failed. And hence we display an error message. If authentication has succeeded, we iterate through the employee List and form <table> markup with EmployeeID, FirstName, and LastName. This table is then displayed on the page as shown in the first figure of this article.